Get digital! We convert all kinds of video tapes to DVD and digital files, including VHS, 8mm, MiniDV, Betamax, VHS-C and more. Custom names for files and disc printing. From a simple talking head to a detailed production, contact us about your business video needs. We have produced videos for training, orientation, promotion, sales, presentation and more. Get those old images digitized! 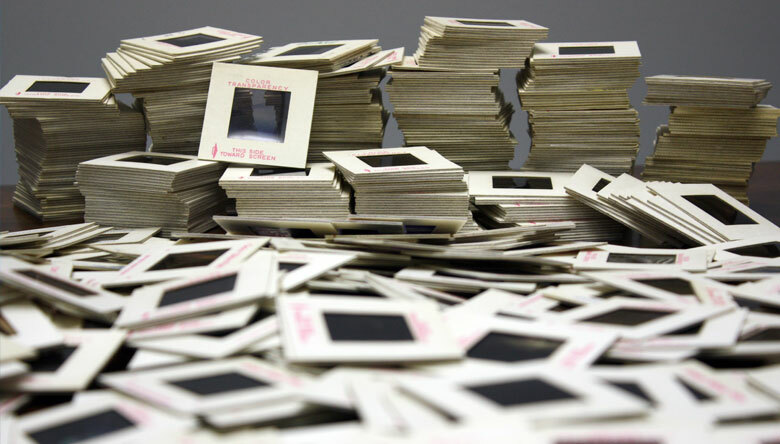 We scan slides and negatives of many different formats. We crop, rotate and color-correct each image to make them look better than before. Whether you need 1 copy or 1,000, we can duplicate your discs (DVD, CD, Blu-ray). Duplications include disc printing and can include your own artwork. We offer fast turnarounds and quantity discounts. Audio cassettes, record albums, and microcassettes are all analog audio formats that can be converted to digital. We can preserve and improve your audio on CD or MP3 files. Have your old 8mm, Super8 and 16mm film reels converted to video. We color correct the video and edit out bad film. You can have your films back as a digital video file (like MP4), DVD, or Blu-ray. Those paper photos hold a lifetime of memories so have them turned into digital images and share them! We even scan large photos, scrapbooks and oversized prints. Get a video produced of your show, recital, play or performance! From simple shows to multiple-camera productions, we can produce the video for your organization. Reel-to-reel audio comes in many sizes and speeds. Have your old audio treasures converted to digital. Choose from Audio CD, WAV or MP3 file. Student athletes know that in order to play at the next level, they have to be seen. A recruiting video lets coaches see what skills and talents the athlete has to offer. Your video, our expertise. Bring us your footage and we can edit it into the video you need - in time and on budget. Business or personal, big or small, you can even sit-in with us as we edit. Turn your photos into a photo slideshow with music and video effects. Perfect for birthdays, anniversaries, graduations and memorials. This video will be a great gift and might just become a family heirloom. Your phone and computer are likely full of various audio, video, and images. We can convert those files into different formats. Not sure what you need? Contact us with questions. It's not an ordinary day. Don't remember it like one! We offer a variety of video packages to fit every budget. Let us make your wedding video all you envision! In the Indianapolis area, MVP is your resource for any video service you need – big or small. Our staff is here to help and answer any questions you may have. From on-location video to editing to duplication, your project will be completed when you need it. See all our services here.